Do people truly understand the implications of a technology such as this? Not only will it save lives, ground water and improve the quality of health for billions – it could stop wars and land grabs in places like the Middle East. But there are those in places of money and power who will fight tooth and nail to make sure that this technology is never adopted on a wide scale, unless of course they own it and are charging for each “unit” of the water it produces. It’s understandable that a company like Nestlé would not like to see thins technology get into the hands of the world’s poor. Nor would the world’s privatised water companies. It could hurt profits big time. 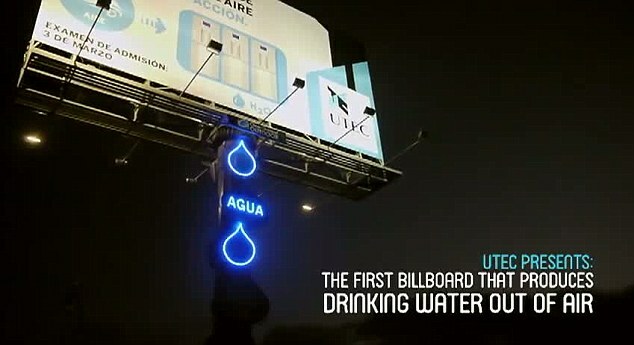 The University of Engineering and Technology in Peru has created the first advertising billboard in the world to make drinking water out of thin air. The breakthrough is designed to inspire more young people to pursue careers in engineering. It is also meant to show how technology can be used to solve local problems and not always an eyesore in the shape of… billboards. The university came up with the idea to transform the country’s high levels of humidity into water in conjunction with ad agency Mayo DraftFCB, the website bigthink.com reported. Lima, the capital of Peru, is the second largest capital in the world that’s located in a desert and access to drinking water is a problem to its 7 million people. Over a million have no access to running water at all and rely on private companies to deliver to their homes. The city is part of a coastal desert of Atacama, the driest in the world. It depends on drainage from the Andes as well as runoff from glacier melt — both sources on the decline because of climate change. Due to the extremely dry climate, annual precipitation is less than 1 inch, many people draw water from wells that are often polluted – worldwide 2.2 million people die every year from drinking contaminated water. The billboard requires electricity to power five generators that make up the billboard’s inverse osmosis filtration system, capturing the air humidity, condensing and purifying the water, and filling it up in 20 litre tanks. The water is then transported through small ducts to a central holding tank at the billboard’s base, where there is a water faucet. The billboard has already produced 9,450 liters of water in just three months, according to Mayo, which it says equals the water consumption of ‘hundreds of families per month’.